If you have been reading the articles on these pages you would have heard about the famous Savage Hearts Diamond. 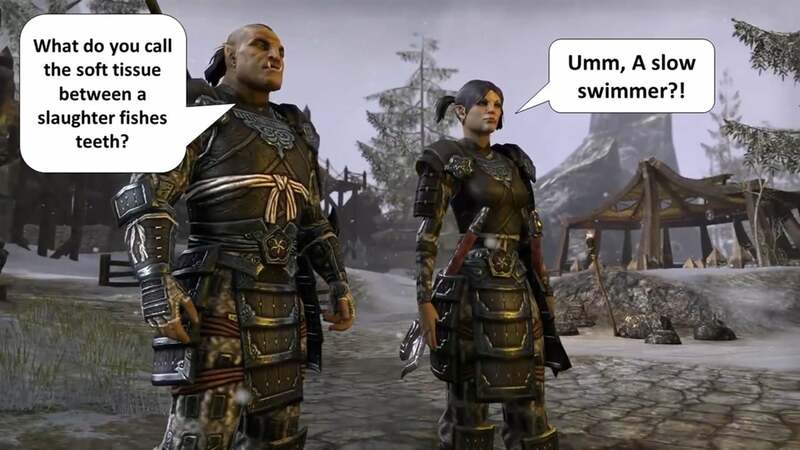 If not I highly recommend that you read about this and many other handy hints to make your adventures in Cyrodiil fun. 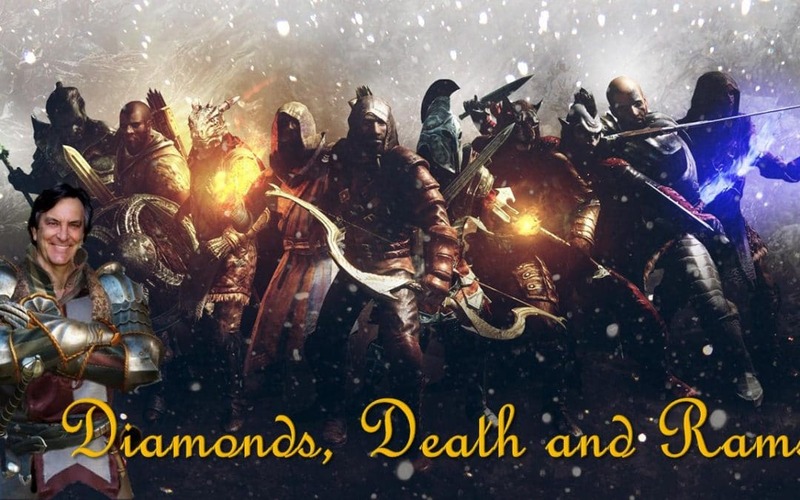 There is another formation that is very effective when sieging in Cyrodiil and it is known as the Savage Hearts Triangle. Up until now I’ve tried to keep this one a secret but I have noticed that other guilds are using it so the cat is out of the bag now. This does not distract from its effectiveness and indeed merely confirms its universal efficiency. Often we will wipe a whole raiding party to take advantage of the effects of dying. When you commit suicide you are able to rapidly transport yourself to another location on the map, either behind enemy lines or back to base to turn in a mission report. This is called, Blood Porting and can be achieved in several ways. The first most common is to go straight up to an enemy and let him slaughter you. Unlike PVE playing when you die in PVP playing in Cyrodiil your armor is not damaged, so there is no cost involved in repairing it. Another method is to take a jump off a cliff or high wall but the most popular is to go swim with the fishes. I do not know of anyone surviving a plunge into a lake filled with slaughter fish, these little monsters will kill you with piranha like efficiency every time. So dying is not really dying and can be used to your advantage. Now about the triangle. Whether you have a small raiding party or a large one it is important to smash the enemy’s wall and doors quickly and efficiently because as soon as the flag goes up they will come swarming to the defence. Time is of the essence and so you will need to know about and use this tactic. We have discussed in other articles the advantage of having ballista’s each side of a ram when attacking a door, the main being that the ballista operator counts as a ram operator as well. A third ballista can also be set up in front of the ram adding another man to the ram strength. This one is used less often because it requires a little extra skill and timing to set up but is just as effective. The other important factor is that when the door is at fifteen percent the ballista’s can be taken down and the ram used to finish the job. This is important because it will give your players time to buff up as a group, put down AOE, prepare your alti’s ready to enter the breach. Note, if your group is using rapids to get to a postern, main door or internal flags be careful not to cancel out the effect by putting down your AOE too early. 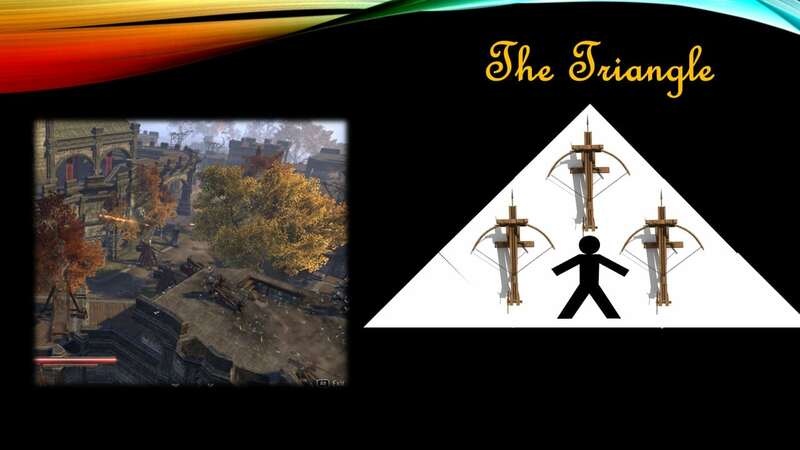 So the triangle can be used for ballistae or trebuchet siege attacks. This is how it works. Your player selects a piece of flat ground and sets up three pieces in the formation shown in the diagram and stands in the middle of the triangle. After a piece of machinery is fired it takes time to reload, so instead of just standing around waiting for this to happen your player gets off one piece and fires another in his triangle. Then he gets off the second one and mans the third and fires. By this time the first one is primed and ready to fire. If the positioning is correct your player does not have to move to fire each siege weapon. The time saving is obvious, and the damage increases from one shot to three, for instance a pact ballista firing one shot, the 2000 damage points increases to 6000 damage in the same time. So a relatively small party can have the maximum of twenty siege weapons set up and firing even before the enemy see the warning flag. The down side is that it takes twice as much time to dissemble the weapons so you have to start taking them down early or be prepared to just leave them. The richer players don’t mind letting them go but for the more frugal among us you just have to start packing up when the enemy wall is about 40% damaged. This can be a good thing because you still need time to buff up and also defend the other siege weapons from attack either from the wall, from the rear or flank. The thing to remember is that like the famous diamond, the advantage gained by the triangle is achieve through practice and discipline. The two ram system. When an outside wall goes down using a ram, you have four choices. The first is to just abandon it and set up another ram at the inside door, the second choice is to pack it up rush to the front door and set it up again, the third and slowest is to roll the ram forward using your team to give it speed as it climbs the stairs and crosses the porch. The fourth method is to have one player use his ram on the outside wall and another ready to set his ram up on the inside wall. This last method is the less wasteful and fastest way to continue your assault on the doors. With all of these methods you need to be in close communication with your team. Please note that you can have too many or not enough players on a ram and it is up to your raid boss to dictate the preferred method. It is a beautiful thing to see a team working together and I have had raids working like a well-oiled machine for hours with everyone gaining thousands of points and experience. The loss of expendable siege soon becomes nothing compared to the experience you gain back. If you want to become part of the fun, just check the raid times on our web page or speak to us on Discord and show up. Do not be intimidated if you are new, we all have to start somewhere and the vets are pleased to share their knowledge to you. 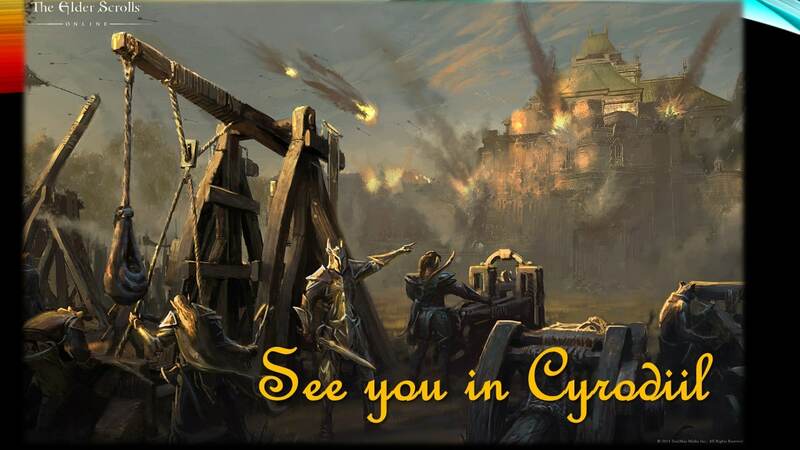 So be a welcomed warrior and I’ll see you in Cyrodiil.